Here is a checklist of useful equipment and supplies. Much of this should be in the zippable tote bag you carry on to the plane or train. A foldable cane. Not only will this provide extra balance and security on uneven pavement or cobblestones, but it sends a signal to surrounding people that this person may be moving slowly, may not respond quickly to the unexpected, may not be stable, and they will give you wider passage, a helping hand, more consideration. A head lamp/lantern/flashlight. 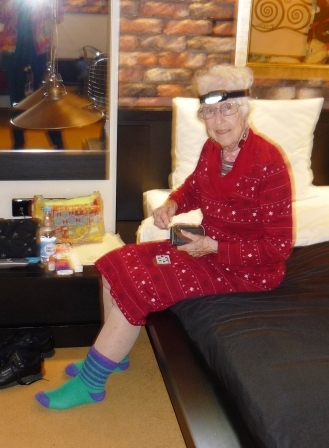 Lighting in hotel rooms may be inadequate for visually handicapped travelers – a bright LED headlamp is great for late-night reading or early-morning packing. In one otherwise excellent Russian hotel, we were told that there would be no electricity between 6AM and 10AM the following morning (thus disabling the elevator, the bathroom lights, and the coffee machine in the breakfast room). We were lucky that we did not need to bring our suitcases down from our second floor room any earlier than 10AM. Wearing my headlamp I descended the steep, dark stairs and retrieved a cold breakfast and thermos of tea for us. My head lamp features an attachment that converts it into a lantern; this was a vital accessory in an electricity-deprived, windowless bathroom. 5. A packet of pop-up wipes such as are used for babies – handy for cleaning hands, spills, surfaces as well as any toilet accidents. 6. Energy bars for snacks. 7. A blow-up neck pillow – make sure it is easy to inflate and deflate, and has a comfortable cover. Older old can fall asleep at the drop of a hat, but also wake up with stiff joints. 8. Travel sox – it is nice to take off shoes if you are on a long flight. 9. A shoe horn in your carry-on – to get those shoes back on after they have swollen in flight. 10. A couple of packets of plastic utensils (very useful in eating that cold breakfast) Nab a couple of extra packets from the airline meal trolley – these are perfect! 12. Medications pre-loaded in pillboxes marked for each day of the week.